Aghii Apostoli Petrou and Pavlou, in Greek, featurs a 3-part basilica from 1886 and a stunning marble belfry from 1913 designed by the architect Perpignan, plus two Russian bells and a Swiss clock. 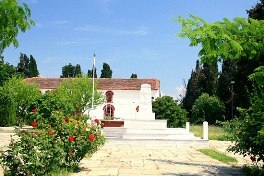 The belfry was modelled after that of Aghia Fotini in Smyrne. Note also the area stone bridges.